I was looking for a café in South Sydney where the food is solid gold. I ended up at The Copper Mill in Alexandria which, despite making a solid effort, doesn't quite achieve that feat of alchemy. The Copper Mill in Alexandria. 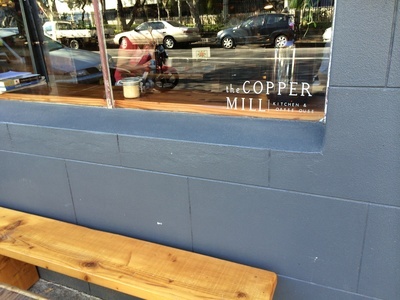 Situated along the mostly industrial Mitchell Street, The Copper Mill is one of the trendy new places that have sprung up in the last few years that cater to the new, young crowd that have made this former warehouse laden neighbourhood their home. With an extremely high rating on Urbanspoon, I was really looking forward to checking this place out one sunny Sunday morning. Given that the place was packed by 9am, clearly so were many other people. First impressions were really good. From the moment I arrived the staff were very cheerful, accommodating and attentive. 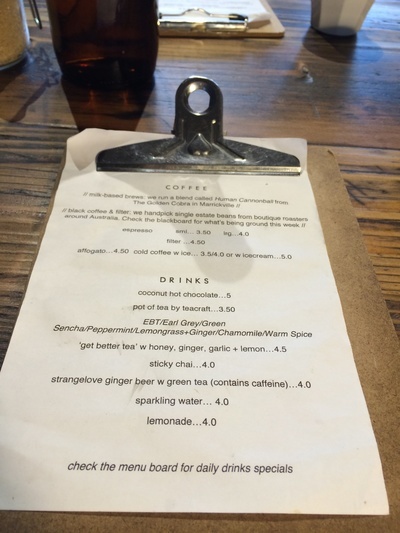 I was greeted by a friendly waitress, seated and handed the drinks menu on a cute little clipboard while I was directed to a slatted chalkboard on the wall behind me to check out the available food options. 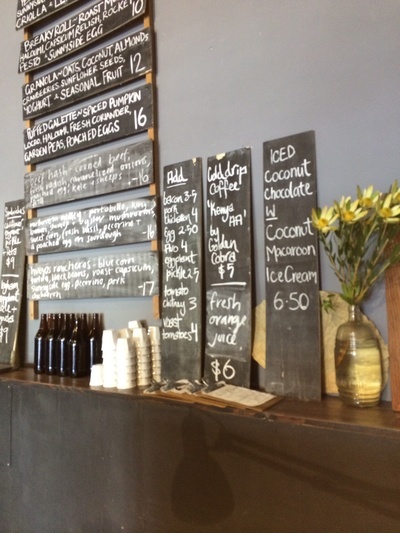 Meal options displayed on a chalkboard collage. As my friend was a little late, I took the opportunity to peek at what my fellow diners had ordered. I'd been tossing up between about three options and couldn't make up my mind, but actually seeing the finished dishes really helped. Although the breakfast roll (two different versions, $10) were very popular and the granola with oats, coconut and almonds ($12) looked fresh and wholesome, I decided on the mushroom medley with basil, pecorino cheese and a poached egg ($16). I can never resist a little alliteration in the morning and I seem to be obsessed with these little brown caps of nutritional goodness at the moment. 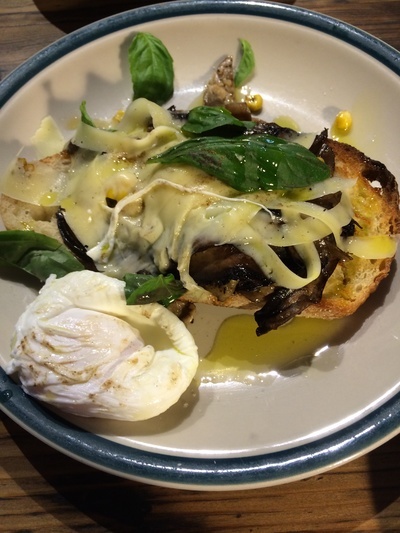 The alliteratively named mushroom medley, with basil, pecorino and a poached egg. My friend went for the brisket hash with kale, feta and caramelised onion all topped with a poached egg ($16), which was one of the more unique options available. Unfortunately I have to say both meals were a bit disappointing. Though decent in size and well seasoned, the mushroom medley was doused in oil and smothered in cheese. The mushrooms were quite greasy too, making the whole thing a wet, heavy concoction that left an unpleasant slimy mouth feel. 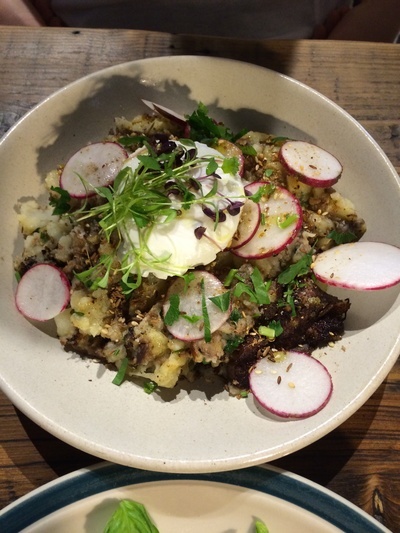 The beef hash, while tasty, was rather misleading as there was no kale or feta in sight, and rather than consisting of a brisket pattie, like at Brewtown in Newtown, it was mashed potato with some brisket mixed through and sprinkled on top. Not bad, just unexpected. On the plus side, the coffee was good and if you have furry friends with you who would also like a feed, that's no problem. While they are not specifically catered to, there is plenty of room on the sunny side walk for them to laze while you, a.k.a their slave, feed them tasty morsels. What the morning lacked in food, it made up for in service, atmosphere and company. Looks like the search for a goldmine south of the city is still on. Where: 338 Mitchell Street, Alexandria, 2015. When: Monday - Friday 7am till 4pm, Saturday 8am - 4.30pm and Sunday 8.30am - 3pm. Good for kids: Not really.